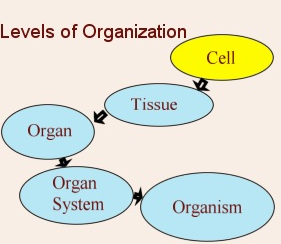 Cells are organized to form tissue, organs, and organ systems. In a healthy organism, all the systems work together. A specialized cell is designed to do a particular job. Nerve cells have long fibers to carry massages. Muscle cells can contract and relax. White blood cells attack bacteria. Large numbers of specialized cells make up tissue. Muscles, blood and nerves are all tissues. Various tissues together make up an organ. Each organ has its own specific job. The heart, the stomach and the brain are all organs. The heart has to pump blood around the body. It is made up of muscle tissue, blood vessels and nerves. Arteries and veins are usually thought of as organ as they consist of several tissue layers. Various organs together make up an organ system. E.g. the circulatory system carries blood to all parts of the body. It is made up of heart, arteries, veins, capillaries and blood. 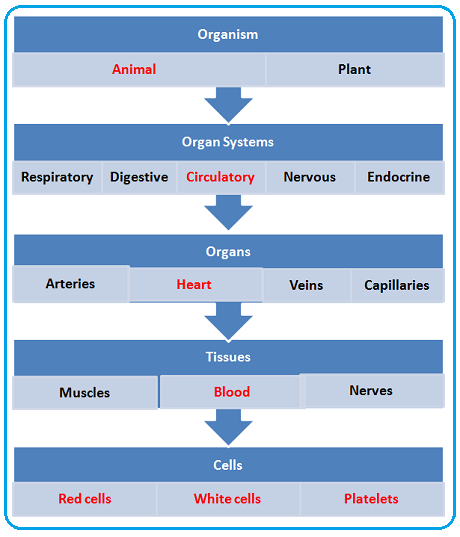 Various organ systems together make up an organism. Organells: a structure within a cell (e.g. nucleus, vacuole, cytoplasm and chloroplast are all organelles of a plant cell). Tissue: a group of cells with similar structures, working together to perform a shared function. Organ: a structure made up of a group of tissues, working together to perform specific functions. Organ system: a group of organs with related functions, working together to perform body functions.